You’ve decided that you want to spray tan someone. Now you need a spray tan machine to actually spray them. Of all the uses you can put an airbrush or spray gun to, spray tanning is actually the easiest to learn and master. Don’t get me wrong, you’ll still run into difficulties, but the process itself is straightforward. In order to adequately cover the tannee you’ll spray roughly 2 ounces on them. It’s not a hard and fast rule, but, in general, figure on 2 ounces per tan. This rule is also a great way to figure out the cost of tanning solution per client. For instance, if a gallon of tanning solution costs $128 then you’ll be using $2 of solution per client (64 ounces in a gallon). Most tanners choose siphon feed equipment simply because they can buy a bunch of bottles in an effort to “portion control” the use of solution. Spray guns are made for covering large ares quickly. Even a petite body has a large area to cover evenly. Spray guns let you spray the same amount of solution in fewer passes. Fewer passes turn into a more even, better blended result. Airbrush guns, on the other hand, take long (30-40 minutes) to complete one session. If your salon offers other airbrush services like makeup, nails and tattoos, then go for airbrush gun, otherwise stick to spray guns. However, don’t get too carried away. An HVLP Gun with an 18 inch spray pattern is WAY WAY too big. Too big of a spray pattern means more material waste to get the same end result. In short, you’ll waste a lot of solution if you get something with too large a spray pattern. If you get smaller than this you’ll spend a lot of time spraying each person and throwing a lot of overspray into the air because of the length of time you’ll spray. If you get bigger than this a lot of your spray will “miss” the client and either settle inside your spray area or float around in the air. This is material waste. Overspray is your worst health enemy and material waste is your worst cost enemy. If you’re choosing a machine for a professional setting, make sure you find one that isn’t too noisy. The whirring sound of the compressor can disrupt the tranquil atmosphere of a spa. Also consider if you are going to do home visits, as noisy machine will be problem in home setting. How many times in a day are you going to use this machine? Is it occasional or 10-20-40 settings in a day? As you shop, you should check each machine’s volume of use. Again, this criterion is most important for professional tan artists, as they often need to perform multiple tan jobs in a row. Machines are often rated for light, medium, or heavy use; light use machines are great for at-home tanners, while heavy use machines are essential for professional salons. When comparing the weight of different options, consider how you intend to use your spray tan machine. If you’re going to use it in a salon setting, mobility is less of an issue. It becomes an issue, however, if you’re a professional who does home visits, or an at-home DIYer looking to perfect your year-round tan. If so, search for a lightweight model that’s easy to transport and store. The perfect spray tan machine needs to fit into your budget. This could range from something as simple as a Iwata Revolution series or Paasche VL to an entire system where the gun itself is just a piece of the whole. When spray tans first became popular, the machines were often equipped with a genuine airbrush, which operates via an air pump compressor. These types of gun are cheaper and make less noise, however it takes longer to apply one session, between 30-40 minutes to coat the entire body in the tanning solution. Also it produces lots of overspray! These systems deliver air generated by a turbine to spray gun through flexible hose. These systems operate at slightly higher pressure between 4 to 10 PSI. This creates an even flow and it reduces over-spray. Turbines are normally smaller than compressors and weigh considerably less. Most of the professional spray tan machines are HVLP type. With LVLP and HVLP machine, you can expect to finish one tan session in 5-10 minutes. Most spray guns are made of plastic or metal. Plastic guns are lighter than metal options, and people who do multiple spray jobs a day often prefer the comfort of the plastic guns. Stainless steel guns, on the other hand, often provide a finer, more controlled mist. Guns also come in single phase and dual phase varieties, which refers to the method by which the solution is atomized and sprayed. You will also need to clean your spray tan gun between uses. If you expect to use your gun frequently, make sure to select a model that’s easy to dissemble and clean. The hose isn’t the most complicated part of the spray tan machine, but the wrong hose can nonetheless impact your spray tan experience. First, consider material. Hoses are available in flexible materials, rigid hard plastic, and long-lasting double coated materials. If your new machine is going to be stationary, an inflexible hose may be fine. For at-home and on-the-road use, however, it’s better to select a flexible hose that doesn’t constrain your movements. 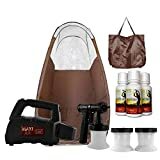 If you want to use spray tan machine at home or want to do mobile spray tanning business, here are top 4 spray tan equipment for home/mobile use. This Maxi-Mist spray tan machine provides beginners with everything they need to start spray tanning. 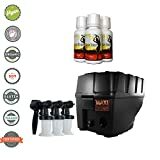 This cohesive spray tan system includes a spray gun, an effective turbine-powered compressor, the hose, and the spray gun cups. It’s also equipped for transport; it comes with a carry bag that doubles as a fabric tent! Powered by a 300-watt turbine, this system offers excellent fine mist atomization. 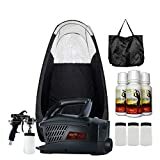 It can handle 10 applications per day, which makes it a good choice for at-home tanners, spray tan professionals offering mobile services or you can use it as a backup unit. This elegantly designed spray tan system offers precise control, reliable performance, and easy-to-use features. The handle is ergonomic and lightweight, which ensures that it’s comfortable to hold. Thanks to the HVLP turbine motor, the compressor provides users with consistent, powerful air flow. The sounds of this powerful compressor are contained thanks to the sound dampening shell, which effectively reduces unwanted noise. Users can even control the pattern of the spray, as this Fascination FX design comes with vertical, horizontal, and round pattern options. This system also comes with several spray tan solutions and a pop-up tent. Most users will appreciate the bright pink/black design, but others may want their spray tan machine to be unobtrusive. 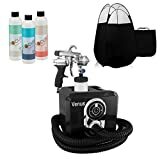 The Venus Ultra kit is an efficient, heavy-duty spray tan system used by beginners and professionals alike. Each kit includes three tanning solutions: Medium Dark, Ultra Dark, and Rapid Develop. It also contains a metal spray gun, which offers precise spray control and long-term use. The compressor uses HVLP turbine technology to deliver consistent tanning results, which are further enhanced by the variable-speed and integrated control features. The system was also designed with aesthetics in mind; the high-gloss chrome finish makes this spray tan machine a welcome addition to any home or salon. The machine boasts an auxiliary heat function, which ensures that the spray solution is warm when it comes into contact with the skin. Washable elements—like the removable air filters—make caring for this machine simple. The Fuji Mini M machine is small yet powerful, combining travel-ready equipment with potent turbine technology. The spray gun features a bled valve-style construction, and it comes with adjustable fluid control and adjustable spray pattern features. The powerful compressor is equipped with a 2-stage motor, and the resulting noise is dampened by rear slots, which cut off direct sound paths. This system is specifically designed for on-the-go tanning technicians, who will appreciate its precision and durable construction. The machine is equipped with a heat dissipation box, which keeps the motor running cooler for longer. This increases volume of use, which is essential for traveling tanning artists. The gun holder bracket gives mobile technicians a place to rest their spray gun, no matter where they are. This high volume spray tan system can perform more than 25 applications per day. While this volume of use makes it ideal for professionals, the streamlined, intuitive design makes it easy enough for beginners as well. The 570-watt dual stage HVLP turbine compressor offers precise, high-powered air flow. The system also comes with multiple screw top lids, a spray gun storage base, an easy flex hose, tanning solution, and a large pop-up tent. The Pro series spray gun has very smooth spray pattern and is best at contouring and detail work. It also has very less overspray! The myriad adjustability features make it a great choice for anyone, though; a quick twist of the spray gun adjusts spray pattern, and the adjustment knob controls spray flow. This MaxiMist system is designed for high-traffic spray tan salons and studios. The powerful turbine can handle over 40 plus tan applications per day, and the Whispertech technology ensures that it isn’t too loud for a salon setting. It’s also equipped with a reusable filter, which prevents midday clogging. 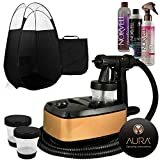 The spray gun comes with many great features, ranging from the ergonomic handle to the “blow dry” feature, which helps tanning solution dry faster. The spray gun has a non-stick needle, which prevents corrosion and buildup. The on/off switch is located on the spray gun, a must-have convenience for the technician doing 40+ tans every day! The Aura Allure system has everything professionals need for fast, precise spray tan applications. The spray gun nozzle uses Satin technology to provide smooth, painless application, and the dial offers perfectly precise flow control. During application, technicians don’t have to worry about freedom of movement; the 11.5-foot, flexible hose makes maneuvering easy. This kit is also stylish, with glossy black surfaces, which makes it perfect for upscale salon use. The kit comes with built-in storage and cable management features. The filtration system minimizes overspray by directing excess solution into the hidden filter. This high-powered spray tan kit offers professional technicians the volume, precision, and control they need on a daily basis. The specially balanced 2-stage motor can tackle dozens of spray jobs per day, and the professional grade applicator is equipped with multiple adjustability features. This system also features one of the quietest turbines on the market; running at only 56DBA, this near-silent machine will pass muster at any salon. Thanks to its exclusive design, maintenance and cleanup are easy. The 10-foot whip hose is lightweight and flexible, which allows technicians to move freely during the spray tan process. This high-value system will be a welcome addition to established spray tan salons, but it might not be a sensible investment for salons that just starting. “How can I airbrush tan someone?“This is a good overview of the process surrounding an airbrush tan. I like to think of it as a successful habit that keeps your problems down. 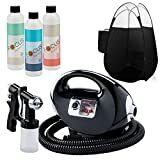 “Video Guide to Spray Tanning for Beginners“This is an excellent video demonstration of how a spray tan should happen. It gives method to the madness. Can you tell that I’m a fan of habits? Frequently Asked Questions about Airbrushing More questions that I had to answer all the time. Very helpful. If you’ve got a question that isn’t covered feel free to contact me. I promise that I’m not nearly as mean as I’d like to think I am.